If you have any questions or want to enquire about dates, use our form to contact Maureen Cassey or see their website for more information. Slip into a different world, just minutes from the busy road: space, peace and far-reaching mountain views. A handful of houses; in the distance, the sea. So calming, it’s possible you never stir from your vine-shaded patio. The two blinding-white Andalusian-style houses are prettily hung with geraniums and overlook a shared pool, edged with pots of ferns, and a garden of wild olive and carob trees. Inviting shady spaces let you follow the changing light all day as it plays across the mountains. Inside your little home – it is tiny – the simple, beamed living space squeezes in sofa and table (Los Olivos has a log fire), colourful pottery on a dresser, copper pans on the wall, a slip of a kitchen in the corner. (This is a place for easy cooking, or eating out; 15 minutes’ drive.) Bedrooms are cool with rough-cast walls, terracotta floors and rustic furniture; the no-frills shower-room does the job. Long-time resident Maureen (plus two friendly dogs) lives discreetly nearby and is quietly proud of her houses and garden. You come here to be outdoors; walks, beaches (15 minutes), books by the pool. Simple relaxation. Special offer: Due to a cancellation Casa Limones is now reduced by £100 per week during 11th - 30th May there are only 3 weeks available for the now reduced rate of £410 per week! Plus Complimentary Welcome Pack! The pool is wonderful, the views over the hills stunning and the cottage a cool retreat from the heat. Maureen is an excellent host and we would highly recommend spending as much time as possible enjoying the rustic home from home. We had a wonderful week in this lovely place. The house is very comfortable, the views are outstanding and it was a real home from home for us - only better!! We'd never been to Spain before but we'll definitely be back to Casa Limones. Great to escape the British weather in the middle of March! Wonderful location and special views with easy access to surrounding towns and great beaches. Maureen is very helpful if required and there is everything on hand at the cottage for every eventuality, really peaceful for a relaxing break, great value for money. Highly recommend, we also had fab weather, want to return for those hot balmy evenings and sunsets that we've yet to experience here. A truly great little find which had everything we needed, in a stunning location. Comfortable, welcoming and characterful. No hesitation in recommending this wonderful place to all lovers of a peaceful Andalucía. We have just returned from a most restful break in Casa Limones which is situated in a peaceful spot overlooking the mountains and coastline. The cottage was very clean and we had the pool to ourselves to enjoy refreshing swims during the hot weather. Restaurants and places of interest are close by – this is an ideal location with plenty of options for eating and sightseeing. Maureen is very friendly and helpful and provides a warm welcome for her guests, her welcome pack was much appreciated and most thoughtful. I definitely recommend Casa Limones for a relaxing vacation. We had a very happy eight days at Casa Limones. Highlights were the Andalucian sun warming the terrace where we ate our meals, the sparkling pool (just big enough for a swim), the views across the rugged hills and the distant sea, and the privacy. This property is ideal for a couple wanting time together, just to read and relax. We loved the silence, broken only by the breeze and the birdsong. Maureen Cassey is an ideal host, warm and friendly but never intrusive (she lives next door). Her two dogs and two cats like to meet the guests and we soon got used to them. In short, idyllic. Casa Limones has been a wonderful place to spend a very relaxing holiday. It's position in the Andalucian hills is fantastic. The lovely picturesque town of Mijas is only 20 minutes away. Also some lovely beaches. Restaurants are plentiful and just a short drive away. We enjoyed the peace and quiet and the fantastic pool and casa. Thank you Maureen for a lovely holiday!! We enjoyed a fabulous relaxing week at Casa Limones. Maureen is a lovely host making us feel so welcome and giving tips on what to see and do in the area. The setup is geared towards relaxation, and we certainly did! Lazy days by the pool, and evening meals cooked on the outdoor grill watching the sunset over the mountains. Simply perfect! It was our first visit to this part of Spain, and it certainly challenged our pre-conceptions of the area. We enjoyed the nearby National Park, and a great visit to nearby Ronda. 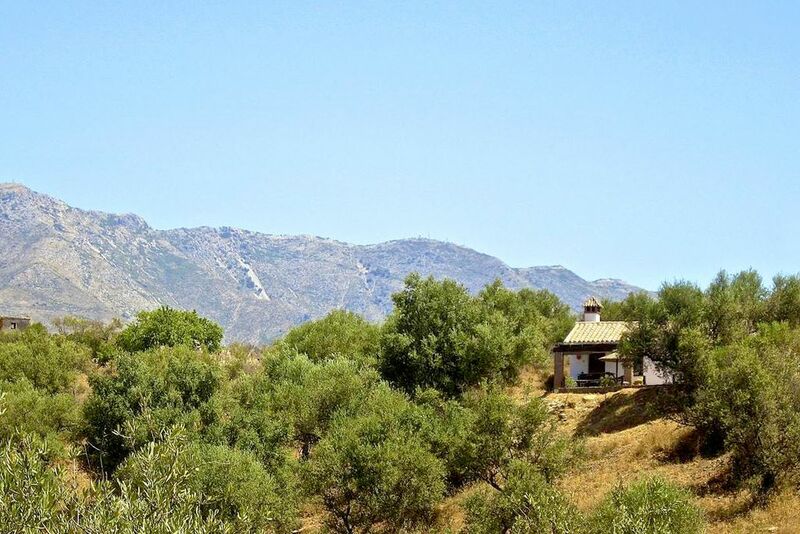 Enjoy spectacular views from the cottages of eagles gliding on the thermals above the Sierras de Ojen National Park, or only a 15 minute drive into the park for magical walks amongst Pine, Mediterranean Oak, Carab and Chestnut trees. Enjoy lunching on local fish at the many Chiringuito bars on the beaches, or dinner watching the sunset transform the colour of the sea to copper tones ! Local olive oil and a huge selection of local organic salad and fruit produce available in local shops. World Heritage Site The Alhambra Palace, the Historical mountain town Ronda dating back to the Romans with it's bridges straddling the deep gorge and vibrant Seville all three are an unforgettable day out. See local life, spend a warm evening in the bustling town square of Fuengirola with it's imposing church, eat at one of the outside cafes with a selection of tapas (The Plaza Bar is my favourite) lots of little boutique shops too. Take a drive to the incredible turquoise blue lakes, see amazing rock formations at El Torcal or visit the newly opened breathtaking Caminito del Rey walkway built onto the side of cliffs along a ravine with spectacular views. Pre book online.